Fra Bartolommeo painted this work in 1509, immediately following his return to Florence from Venice. 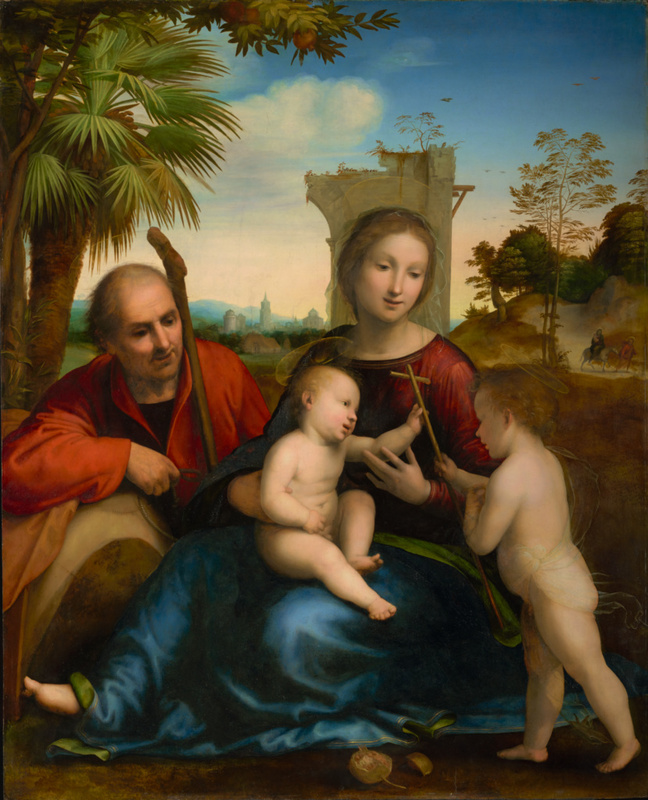 In a scene of calm grandeur, the Holy Family is shown resting on their flight into Egypt under a date palm and pomegranate tree, while the Infant Saint John the Baptist presents a reed cross to the Christ Child, seated on the Madonna's lap. Saint Joseph leans on the donkey’s pack saddle, calmly observing the meeting of Christ and Saint John. A pomegranate, symbolic of Christ’s resurrection, lies half eaten in the foreground. The palm tree on the left is another symbol of the Passion, representing the palm fronds that would pave the road on Christ's final entry into Jerusalem. Fra Bartolommeo constructed an evocative landscape which harmoniously combines the different stages of the narrative. In the distance on the right, the Holy Family are shown fleeing Bethlehem on a donkey, escaping King Herod’s massacre of the innocents. The landscape also includes a ruined arch, which alludes to the coming of Christ and the downfall of the Roman Empire's pagan order, personified by the Virgin. Although the Gospels relate that Christ and Saint John the Baptist first met as adults when the saint baptized Christ, Fra Bartolommeo here draws from New Testament apocrypha which describe the early life of Christ and were popular sources of inspiration for artists of this period. The artist creates a remarkable tension between the Madonna and two children, both spatially and emotionally. They form a triangular shape, accentuated by the child Baptist’s outstretched left leg and the Madonna's extended right leg, the foot of which points outward. Fra Bartolommeo captured the Florentine ideal of beauty in the Madonna’s graceful pose and softly modelled face and neck, which is further enhanced by her placement in a pristine landscape, an aspect of religious painting to which the artist made a unique contribution. George Nassau Clavering-Cowper, third earl Cowper, 1738 - 1789 (Panshanger, Hertford, England; Florence, Italy), by inheritance to his second son, Peter Leopold Louis Francis Nassau Clavering-Cowper, 1789. Source: Recorded in a Florentine inventory in 1779. Peter Leopold Louis Francis Nassau Clavering-Cowper, fifth earl Cowper, 1778 - 1837 (Panshanger, Hertford, England), by inheritance to his son, George Augustus Frederick Cowper, 1837. George Augustus Frederick Cowper, sixth earl Cowper, 1806 - 1856 (Panshanger, Hertford, England), by inheritance to his son, Francis Thomas de Grey Cowper, 1856. Francis Thomas de Grey Cowper, seventh earl Cowper, 1834 - 1905 (Panshanger, Hertford, England; Wrest Park, Bedford, England), by inheritance to Lady Ethel Anne Priscilla Fane Grenfell Desborough, 1905. Ethel Anne Priscilla Fane Grenfell, Baroness Desborough, 1867 - 1952 (Panshanger, Hertfordshire, England), by inheritance to Imogen Gage, 1952. Imogen Gage, viscountess Gage, died 1969 (Firle Place, Lewes, East Sussex, England), upon her death, held in trust by the Trustees of the Firle Estate Settlement. Trustees of the Firle Estate Settlement, sold through Deborah Gage Works of Art Ltd. (London, England) to the J. Paul Getty Museum, 1996. Waagen, Gustav Friedrich. Treasures of Art in Great Britian: Being an Account of the Chief Collections of Paintings, Drawings, Sculptures, Illuminated Mss., &c., &c. 3 vols. (London: John Murray, 1854), vol. 3, pp. 10-11. Catalogue of the Art Treasures of the United Kingdom, Collected at Manchester in 1857, exh. cat. (London: Bradbury and Evans, 1857), p. 21, no. 118. Crowe, J. A., and G. B. Cavalcaselle. A New History of Painting in Italy from the Second to the Sixteenth Century. 3 vols. (London: John Murray, 1866), vol. 3, pp. 449-51, ill.
Exhibition of Works by the Old Masters and by Deceased Masters of the British School, exh. cat. (London: Royal Academy of Arts, 1881), p. 45, no. 207. Gruyer, Gustave. Fra Bartolommeo della Porta et Mariotto Albertinello (Paris: J. Rouam, 1886), pp. 35-36, 97. Knapp, Fritz. Fra Bartolommeo della Porta und die Schule von San Marco (Halle: Wilhelm Knapp, 1903), pp. 133, 135-36, fig. 63. Crowe, J. A., and G. B. Cavalcaselle. A New History of Painting in Italy from the II to the XVI Century. Edward Hutton, ed. 3 vols. (London: J.M. Dent & Co., 1909), vol. 3, pp. 412-13. A Catalogue of an Exhibition of Old Masters in Aid of the National Art-Collections Fund, exh. cat. (London: Grafton Galleries, with Philip Lee Warner, 1911), pp. 29-32, no. 27, fig. 12. Gabelentz, Hans von der. Fra Bartolommeo und die Florentiner Renaissance. 2 vols. (Leipzig: Karl W. Hiersemann, 1922), vol. 1, pp. 74, 152; vol. 2, pp. 47, 98-99, 193, 278. John Harris Collection. Panshanger Gallery (n.p: n.p., 1925), unpaginated, under galleries 1, 2, 4. Venturi, Adolfo. Storia dell'arte italiana IX: La pittura del cinquecento. 7 vols (Milan: U. Hoepli, 1925-1934), vol. 1, pp. 286-88, fig. 199. Bryan, Michael. Dictionary of Painters and Engravers (London: n.p.,1930), p. 90. Berenson, Bernard. Pitture Italiane del Rinascimento. Emilio Cecchi, trans. (Milan: Ulrico Hoepli, 1936), p. 41. Chamot, M. "Panshanger Hertfordshire II." Country Life (January 1936), p. 65. Berenson, Bernard. The Drawings of the Florentine Painters. 3 vols. (Chicago: University of Chicago Press, 1938), vol. 1, p. 161; vol. 2, pp. 23, 32, 35, 39, 41, 44. Italian Art and Britain, exh. cat. (London: Royal Academy of Arts, 1960), p. 50, no. 102. Freedberg, Sydney Joseph. Painting of the High Renaissance in Rome and Florence (Cambridge, Massachusetts: Harvard University Press, 1961), p. 212. Garlick, Kenneth. "Viewing in Tranquility Pictures at Firle Place, Lewes." Country Life (June 6, 1974), p. 1430-31, fig. 3. Borgo, Ludovico. The Works of Mariotto Albertinello (New York and London: Garland Publishing, 1976), pp. 391-92, 439-42. Hale, John. Italian Renaissance Painting from Masaccio to Titian (Oxford: Phaidon, 1977), unpaginated, fig. 131. Garstang, Donald. "Suonano I campanelli d'allarme alla National Gallery: Il parere di Nicholas Penny sulla proposta di notfica europea." Gazzetta Antiquaria 32 (1997), p. 43, ill. The National Gallery Report, April 1996-March 1997 (London: National Gallery Publications Limited, 1997), p. 28, ill.
Jaffé, David. Summary Catalogue of European Paintings in the J. Paul Getty Museum (Los Angeles: J. Paul Getty Museum, 1997), p. 5, ill.
Gribbon, Deborah. "Selected Acquisitions Made by the J. Paul Getty Museum, 1995-97." Burlington Magazine 139, no. 1136 (November 1997), p. 824, fig. 9. Fredericksen, Burton B., et al. Masterpieces of the J. Paul Getty Museum: Paintings (Los Angeles: J. Paul Getty Museum, 1997), pp. 22-23, no. 8, ill., entry by David Jaffé. Walsh, John, and Deborah Gribbon. The J. Paul Getty Museum and Its Collections: A Museum for the New Century (Los Angeles: J. Paul Getty Museum, 1997), pp. 107, 113, ill.
Tanabe, Kiyoshi. "Fra Bartolommeo's The Rest on the Flight into Egypt." Daito Bunka University Bulletin 36 (March 1998), pp. 53-64, fig.1. Kirsh, Andrea, and Rustin S. Levenson. Seeing Through Paintings: Physical Examination in Art Historical Studies (New Haven: Yale University Press, 2000), pp. 113, 118, figs. 108, 109. The J. Paul Getty Museum Handbook of the Collections. 6th ed. (Los Angeles: J. Paul Getty Museum, 2001), p. 97, ill.
Echinger-Maurach, Claudia. "Michelangelo und Rubens erinnern sich an Schöpfungen Fra Bartolommeos" In Zwischen den Welten. Beiträge zur Kunstgeschichte für Jürg Meyer zur Capellen. Damian Dombrowski, et al., eds. (Weimar: VDG, 2001), pp. 80-82, fig. 4. Zuffi, Stefano. Gospel Figures in Art. Thomas Michael Hartmann, trans. (Los Angeles: J. Paul Getty Museum, 2003), p. 113, ill.
Allen, Denise, et al. Masterpieces of Painting in the J. Paul Getty Museum. Rev. ed. (Los Angeles: J. Paul Getty Museum, with Thames & Hudson, 2003), pp. 24-25, no. 9, ill., entry by David Jaffé. Ellis, Charles. "Documents for the Third Earl Cowper's Collection of Paintings and Drawings," Paragone/Arte 60 (March, 2005), pp. 41, 55, no. 45, ill.
Zuffi, Stefano. European Art of the Sixteenth Century. Antony Shugaar, trans. (Los Angeles: J. Paul Getty Museum, 2006), p. 295, ill. The J. Paul Getty Museum Handbook of the Collections. 7th ed. (Los Angeles: J. Paul Getty Museum, 2007), p. 96, ill.
Ellis, Charles S. "Documentation for Paintings by Fra Bartolomeo in the Salviati Collection at Florence." Mitteilungen des Kunsthistorischen Institutes in Florenz 54, no. 2 (2010-2012), pp. 377-86, fig. 2. Lesson in which students observe how artists use continuous and sequential narratives in three artworks. They illustrate a new narrative and write it.